I’m sure you’ll be familiar with the work of Theodor Seuss Geisel, probably by his pen name, Dr. Seuss. He’s written several most popular childrens’ books of all time, and has created some amazing characters. We’re particularly fond of Horton Hears a Who and How the Grinch Stole Christmas. As Geisel died in 1991, I have to admit I was a little surprised, and curious, when I was invited* to read a new Dr. Seuss book. It’s called What Pet Should I Get?, and apparently Geisel wrote the story sometime between 1958 and 1962, but the manuscript and illustrations weren’t discovered until 2013. It’s like a super secret bonus Dr. Seuss book! What Pet Should I Get? features the same brother and sister from the popular Dr. Seuss book One Fish Two Fish Red Fish Blue Fish. The text and illustrations are classic Dr. Seuss – with all the rhyme, repetition, humour and quirky characters that he is renowned for. 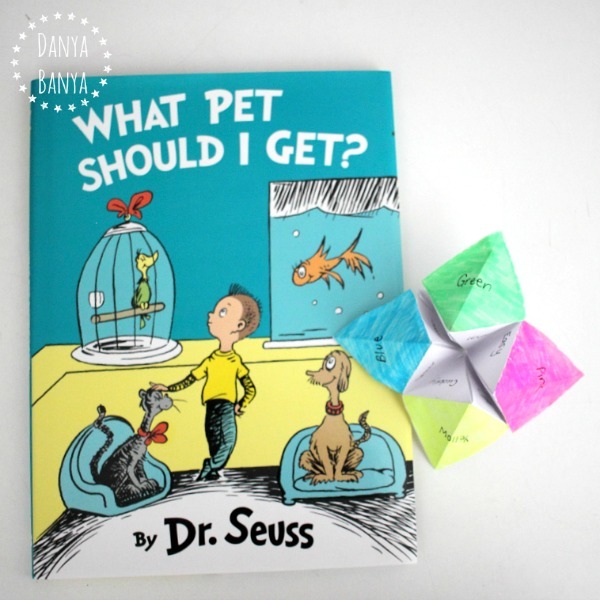 The story talks about the many kinds of pets available, but more to the core of this story, is the difficulty of kids making up their minds under pressure, when faced with a multitude of excellent options. How to choose? How to choose? How to choose? We could only pick one. That is what my dad said. that mind in my head? 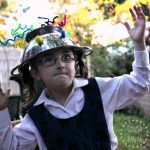 I’d been meaning to introduce chatterboxes to my kids for a while now, and it occurred to me that a chatterbox could be a novel way for kids to play at making up their mind in this sort of situation. I didn’t want the chatterbox to select any random pet though. I wanted it to select a pet that would suit the needs of the owner (and thus, the owner’s situation would be more likely to suit the needs of the pet!) So I thought I’d encourage people to indicate the type of pet they are looking for (easy, unusual, indoor or cuddly), before they find out their answer. 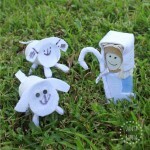 Use a piece of white paper. Fold the top edge over until it lines up with the side. Crease. Cut off any overhanging paper. Open up. It should now look like a square with diagonal creases. Fold one corner into the centre. Repeat with the other three corners. Flip and fold one corner into the centre. 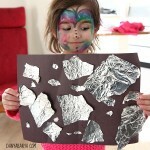 Fold in half one way, creating a horizontal crease. Undo and fold in half the other way. 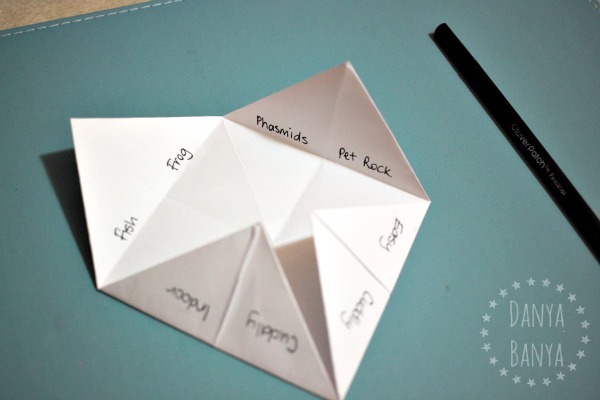 Open that last fold, and flip. Colour in each corner a different colour. Label the colours with a fine black marker. Flip. Label the eight sections: Indoor x 2, Unusual x 2, Easy x 2, Cuddly x 2. Open up and label the inner eight sections: Hermit Crabs, Fish, Frog, Phasmids, Pet Rock, Trum’pet’, Bunny, Cat. To play, invite someone to pick a colour, and then spell out the colour, moving the chatterbox backwards and forwards with each letter. Leave it open on the last letter, so they can see the type of pets (easy, unusual, indoor or cuddly) on the inside. 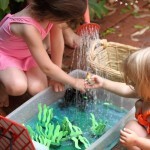 Invite them to pick out a type of pet, and spell out the letters of that word. 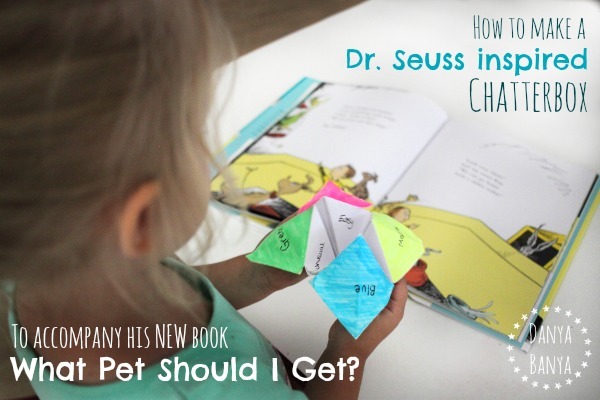 Have them pick a type of pet again, and this time lift the flap to reveal the answer. All this is chatterbox play has been fantastic reading and spelling practise for JJ, by the way! JJ is such a big year one girl now. 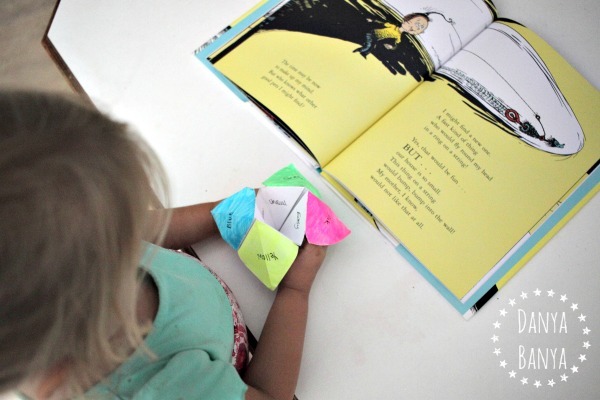 Apparently she’d seen chatterboxes before in kindergarten (spoiling my thunder – ha!) but she hadn’t learnt out how to make them, and those ones definitely didn’t go with this particular book, so she was really happy to play with one again. My almost 3.5 year old daughter Bee is fascinated with our new chatterbox too – even if she doesn’t understand about spelling just yet. She happily pretend spells so that she can play along, just like her big sister. * Disclosing that I received a copy of What Pet Should I Get? for review purposes. I wasn’t obligated to write this post. I have, at my own discretion, included affiliate links. An affiliate link means I may earn an advertising or referral fee if you make a purchase through my link at no extra cost to you. 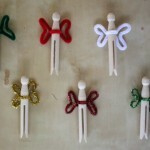 This is one of the ways that I can earn an income whilst writing this blog. Thank you for your support. I used to play this when I was a girl…..but instead of 'what pet should I get' it was 'what boyfriend do I want' and some of the boys in our school class was named. We had fun. 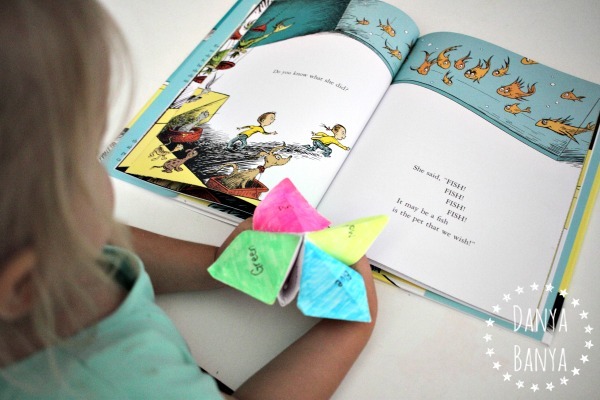 What a fun activity to go with this "new" Dr. Seuss book! I was super excited to get it at the library a couple weeks ago. I have it hidden away to share with the kids this week as we start celebrating Dr. Seuss' birthday. 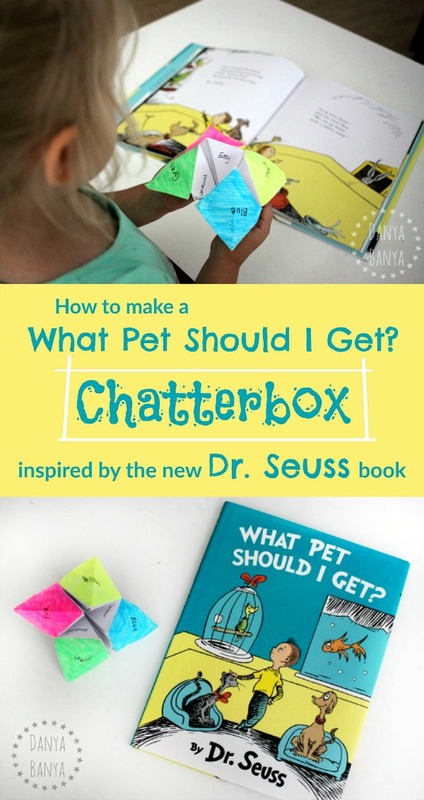 We will definitely be trying out the chatterbox idea. Awesome! It's a cool book huh. Hope your kids like their chatterboxes!